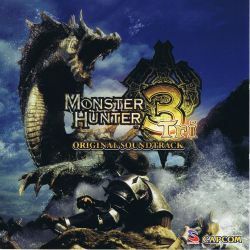 The two bonus tracks of the original Japanese releases are not included in this release. Also available in Europe through Soulfood Music at September 10th, 2010. The composer breakdown comes from the retailer Tsutaya's listing for the album, since the booklet does not contain track-by-track credits. The booklet and the game's credits list Reo Uratani as a composer, but he's not listed by Tsutaya for any track. 1-02 should be "Invitation to the Guild"
1-12 should be "Poogie's Great Delight / 3(tri-)Version"
1-14 should be "Earth Sand and Fiery Winds / Barroth"
1-16 should be "The Primordial Mighty River / Flooded Forest"
1-17 should be "Trap of the Muddy Stream / Gobul"
1-22 should be "Mountain of Sparks / Volcano"
1-26 should be "The Lunar Abyss"
2-02 should be "Straw Hut Memories"